I came upon a Chinese camp. About a hundred Chinamen had pitched their tents on a rocky eminence by the side of their diggings. When I passed they were at supper, and had all the curious pots and pans and other fixins which I had seen in every Chinese camp. - anon. This is a Chinese gold miners' camp. 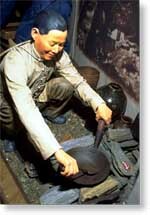 By 1852, 25,000 Chinese had come to what they called Gum Shan - "Gold Mountain," making them the largest foreign group in the mining region at that time. Their sites were truly camps, for they usually worked and lived in large communal groups. Then gold was first discovered in California there was essentially no government to regulate the mining, or to collect taxes on gold. Mining was a free-for-all. In 1849 one enthusiastic miner had declared: Something was said about putting a stop to foreigners digging in the mines, but citizens said, let them come, there is room for the world for generations! But things changed quickly in the gold fields, and that open attitude didn't last long. The mines soon became crowded and competition increased. Who became a target of all those frustrated miners? Anyone who was a not American - especially if their ethnicity, language or customs were easily identified as "different" than the Yankees. First it was the miners from Mexico, Chile, and Peru. Then it was the Chinese. 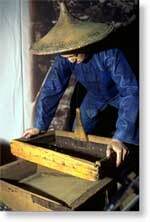 The Chinese were very efficient miners. Because they managed to get gold out of claims which whites had abandoned as unprofitable, their success was especially resented. They were an easy mark for discriminatory taxes. 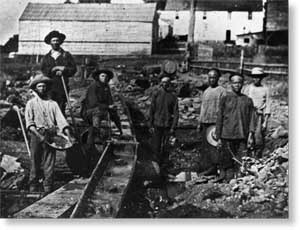 By 1870, the Foreign Miners Tax was bringing in nearly one-quarter of the State's revenue.